Fancy a bit of sci-fi thriller? 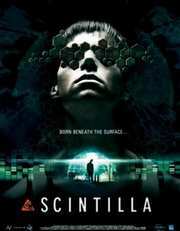 Then Metrodome Distribution have your back, as they release Billy O'Brien's Scintilla on DVD this coming 18th August. Starring John Lynch, Morjana Alaoui, Antonia Thomas, Craig Conway, Beth Winslet and Ned Dennehy, this has a runtime of 94 minutes and comes with a recommended retail price of £12.99. Incidentally the film also apparnetly inspired a newly formed super-group The Scintilla Project, fronted by Saxon’s own Biff Byford, who will be releasing their album The Hybrid, featuring songs inspired by the film, on the same date. This is set deep underground in the wilds of a former Soviet state, where strange genetic experiments are taking place. A war weary mercenary is hired to lead a company scientist, to the secret underground laboratory. There, with his team of mercenaries, they intend to steal the research in the laboratory. Along the way John and his companions face dangerous militia involved in a bloodthirsty civil war, strange monsters lurking in the abandoned tunnels of the old Soviet bunker and finally he meets the scientist running the genetic experiments, and her terrifying secret. Well first we had Nightwatch then Daywatch being the former Soviet Union which were just bearable, and now we seem to get in-indated with all sorts of Eastern block offerings of post acoptoliptic senarios, mostly on cheap budget labels, which are highly forgettable. Got a feeling this would be the same. Another countries now that are right into making si-fi/horror movies in a big way is S Korea. Again not so brilliant due to unknown cast and poor budjets, but there is an exeption and thathas broken box office records in Asia, and that is 'The Host', which has the most realistic CGI monster ever seen, well acted and worth the pric eof buying the DVD.